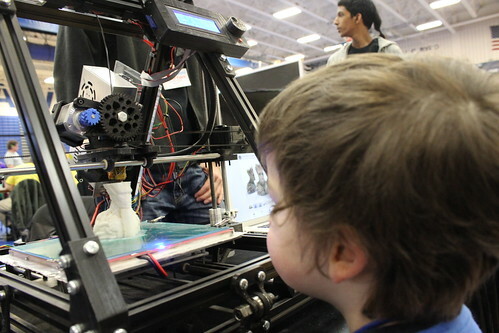 From breastfeeding to the White House, I’ve had a most unexpected 3D Printing journey. In February, I got to chat with Jess Hedstrom on her Printing Everyday Podcast. If you haven’t had a chance, definitely check out her show. Hearing all the stories of the personalities involved in 3D printing has been fascinating. My mother drove a school bus for 24 years. 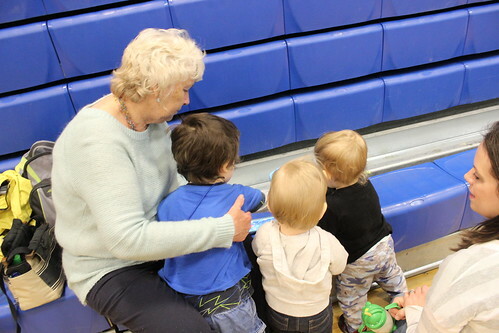 During the school year she called Friday and Saturday nights “Wine Nights” because she could drink a glass a wine and not have to worry about getting up obscenely early the next morning. Well, after 24 years, she retired, meaning every night could be a wine night! 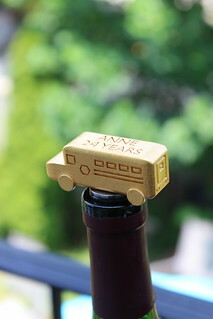 To help celebrate, I wanted to get her a school bus wine stopper. 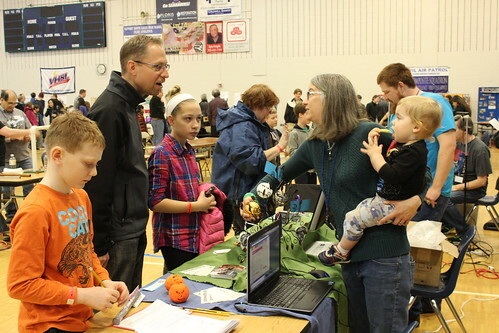 Oddly enough, there seem to be an absence of products that combine “school bus driving” and “alcohol.” : ) Luckily, that’s exactly the niche 3D printing and Shapeways is for! 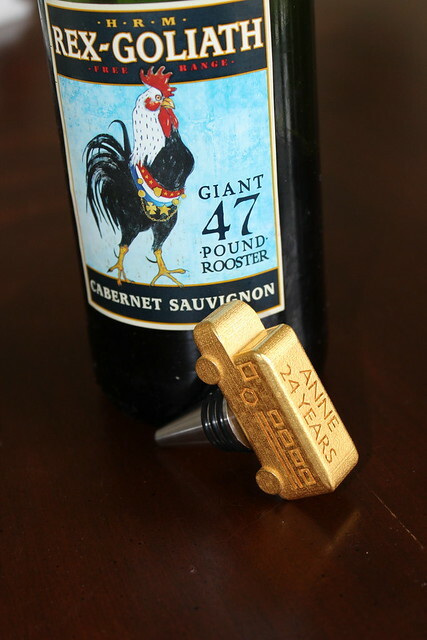 I designed and 3D printed her a customized School Bus Wine Stopper. I’m still new at 3D Modeling and Blender and by no means an expert. 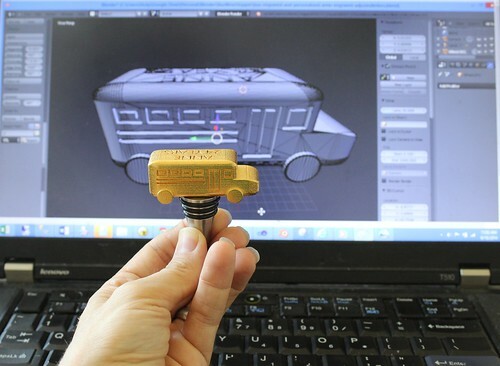 But for what it is worth, here’s how I made my School Bus Wine Stopper a reality with Blender, Shapeways, and SS Niles Bottle Stoppers. Maybe something out there will be helpful to your projects! With 3D printing, you often pay by the volume for the material. With that in mind, was it worth it to me to pay more to print the stopper portion? Bottle stoppers on the internet were just a couple of dollars. It would cost me more to custom-print that portion. Purchasing a pre-made stopper also took some risk out of my process as that was one less piece I had to worry about sizing right and fitting with O-rings and all that. An added bonus is the only material (as of this post writing) at Shapeways that is “food-safe” is the ceramics and I knew I wanted my stopper to be in steel. I purchased Bottle Stoppers from SS Niles Bottle Stoppers. It was already a proven product and manufactured in FDA-grade food-safe stainless steel. They have many different types of stoppers to choose from for different applications. I used the 302 product which included a 3/8” stud. It really really really helps to know what material you plan on printing in and what it’s limitations are, so you know your measurements from the get go. 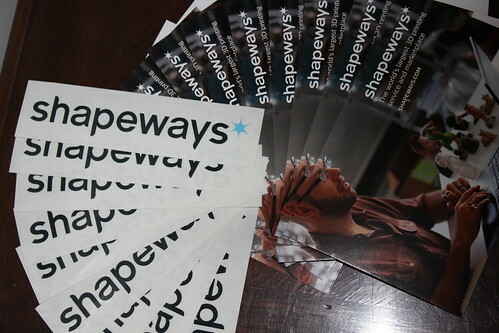 Shapeways has detailed design recommendations for each of its materials. For my mother’s wine stopper, I knew I wanted steel. I knew from the breastfeeding pendants that it feels solid and sturdy. I also knew the gold plated steel (which happens to be school-bus appropriate yellow) is gorgeous. A rigorous review of the steel materials properties page had me mentally poised that all my walls, all my engravings, etc would have to be 1 mm deep and wide. 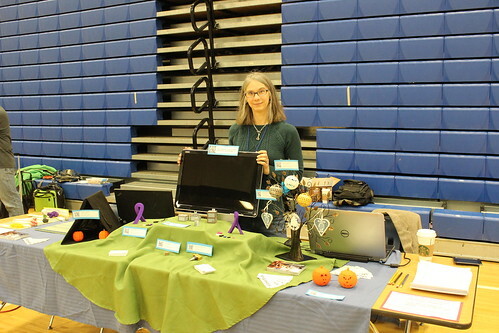 Knowing that from the very beginning was immensely helpful for the design. 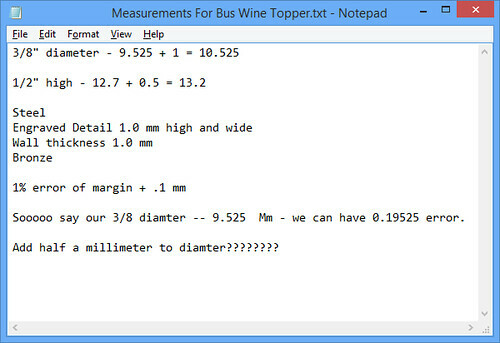 I took measurements of existing wine stoppers and the stopper I ordered from Niles Bottle Stoppers so I knew my dimension of my bus right away. 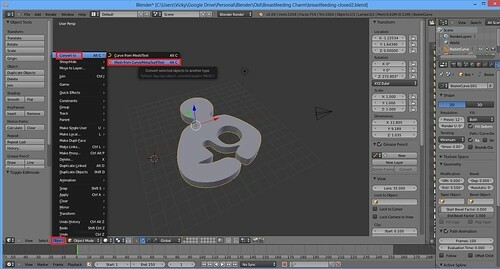 Although it is easy to scale things in Blender, I still recommend knowing your base object size right away. Here’s why– if you do all your engravings and additions and then you size your object up or down– you’re also mucking with the sizes of all your details. So if you had a compliant 1mm engravings and you size it down to 75%, suddenly, you have engravings that are now too short and you’ll have to fix them all. My day job is programming and I definitely know the benefits of naming your form elements. I found the same thing to be beneficial in modeling in Blender. I ended up with dozens of objects for my windows and doors and headlights. Keeping the default names of “Cube.001”, “Cube.002”, “Cube.003” would have been tedious to keep up with, so I made sure to give them more meaningful names. I started with two “cubes” that I scaled to make the body of my bus. I selected them both and went to Object->Join to fuse them into a single object. I wanted to round the corners, but I didn’t want to bevel every single edge, so I got to learn about setting the Bevel Weight for specific edges in order to control how each edge was going to be beveled. And then I went under Modifiers and added a Bevel Modifier. 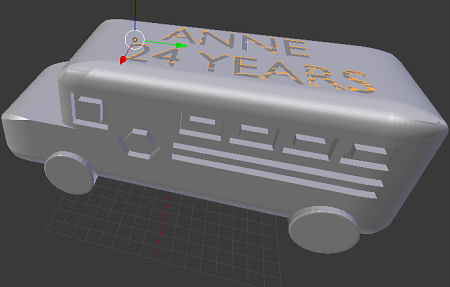 With my details for the bus, I had a couple of choices, I could engrave my windows and doors into my bus base so they were set into the bus body, or I could raise them out of the bus base. At the time I chose engraving. Why? I’m a cheapskate. With the steel pricing at the time, the amount of material was the biggest factor in cost. 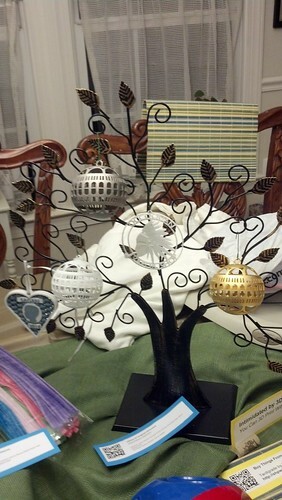 Everything you engrave out of your design, that is less material and saves you money! And speaking of saving on material cost, my bus is hollow underneath. 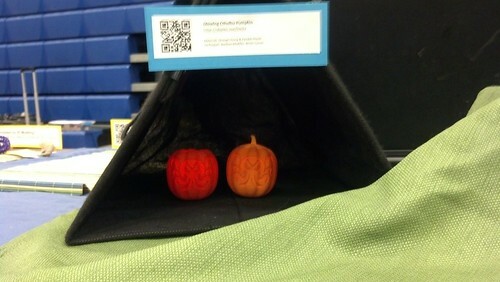 There are different techniques to hollowing objects out. With this project, I simply made some smaller cubes and used the Boolean Modifier (more on that below) to subtract them from the bigger bus. 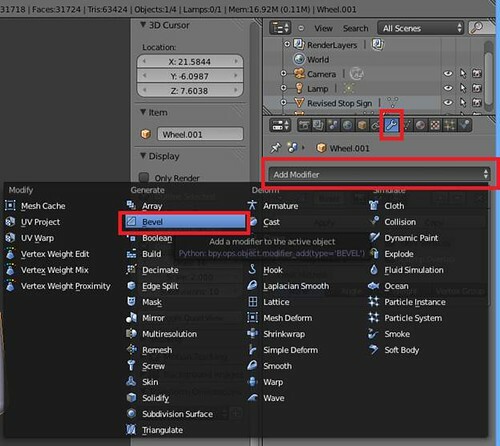 Process – Boolean Modifier Crazy!!! After that, pretty much of the rest of this project was all done through the Boolean Modifier. 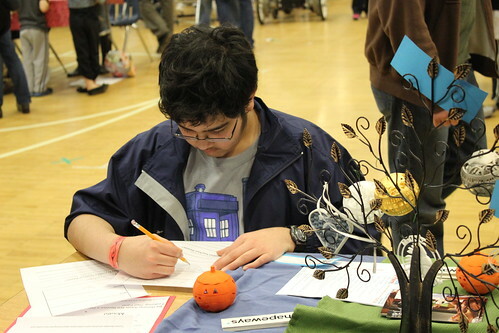 I did a LOT of subtracting of objects from each other. A lot of it. The Boolean Modifier is pretty easy. 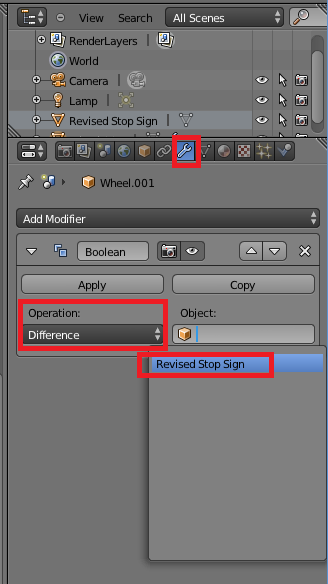 You click on your Base Object and then you click on the Modifiers icon. You select Boolean. 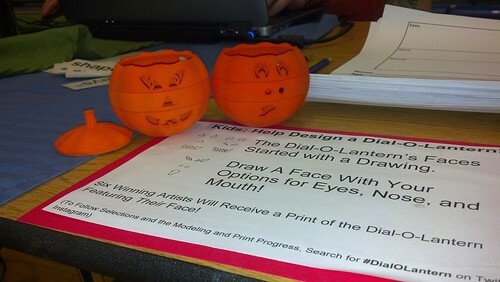 Then for Operation, most of what I did was Difference (Subtracting one object from another). Then you select your second object. 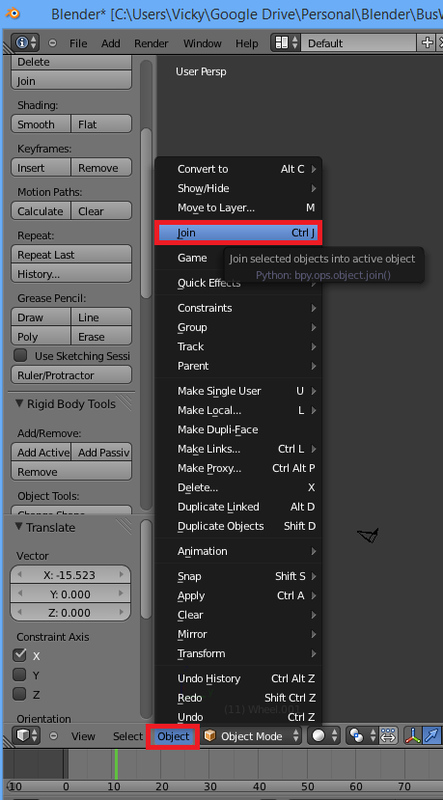 Remember above when I recommended naming your objects? Here’s a situation where is it’s helpful. You aren’t sifting through dozens of “Cube.001”, “Cube.002”, “Cube.003”. 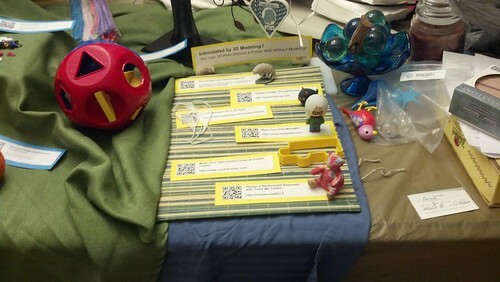 Naming your objects makes it easy to pick the right one to subtract. So in the above photo, I start with three objects—a large rectangle and then two smaller ones. 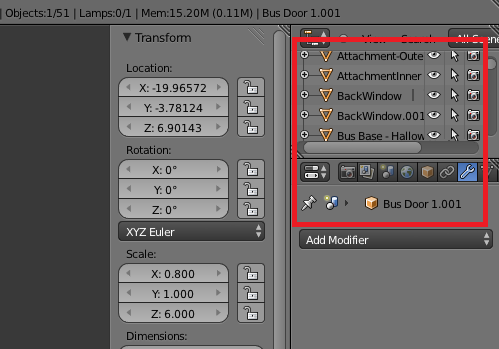 I use the Boolean modifier to “Subtract” the two smaller rectangles from the larger one and I end up with my school bus door. With my end result intended to be steel, I made all my engraving lines 1mm thick and 1mm deep. And a quick tip. 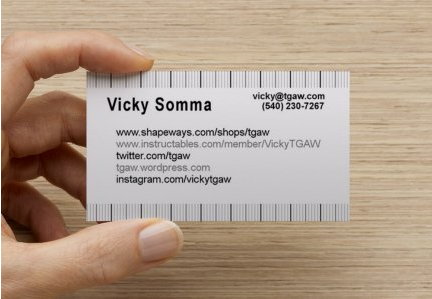 I initially made this mistake and I’ve seen others on the Shapeways forums make the same miscalculation. When you are making your object sizes, it’s easy to think, “Oh, my minimum wall requirement is 1mm, so I want my outer object to be 1mm larger than my inner object.” That’s not necessarily the case because you are likely making more than one wall. Take, for example, my cylinder to hold on to the Wine Stopper stud. My outer cylinder has to actually be 2mm wider than my inner cylinder– because I’m going to have TWO walls. I want them both to be 1mm thick for steel. 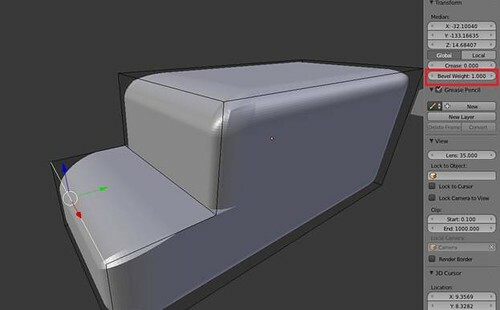 Continuing the Boolean Modifier craziness, once I made all my windows and doors and headlights and grill lines, I used the good ole Boolean Modifier again to subtract (aka engrave) those items from my base bus body. And the same went for the text at the top of the bus. 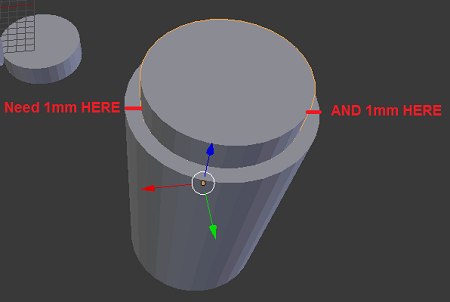 Quick Tip With Engraving Text—I’ve found it to work better if I convert my text to mesh and then extrude it. The normals of the faces work out better for the Boolean Modifier Difference operation. When I was ready to try my model out on Shapeways, I went to File->Export and saved it as an STL file. When I uploaded my .STL to Shapeways, however, their checks indicated that I had some thin walls with the “A” in my engraved text. I fixed that by manually moving vertices around and uploaded a new model. 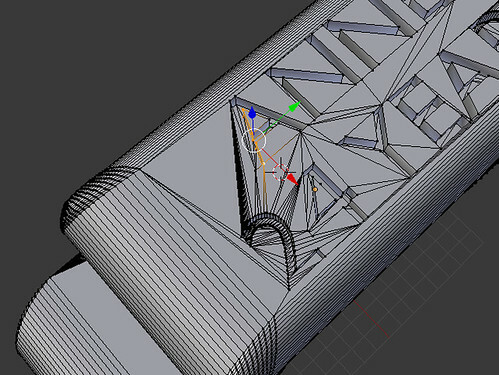 I’ve only been 3D modeling six months or so and I’m finding math to be quite valuable. 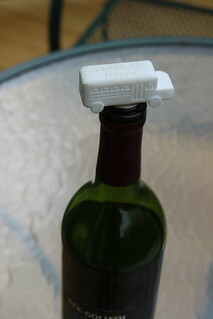 A good example of this is fitting my bus on the stud for the Niles Bottle Stopper I purchased. The stud itself is 3/8” in diameter. I work in millimeters, so I just used Google to figure out the conversion. Converting Inches to Millimeters, Thanks Google! So basically what I wanted was a nice little cylinder to fit over that stud. If I was going to error, I would want my hole to be TOO big. I could always fill it with adhesive or Gorilla Glue. I didn’t really want my hole to be too small and put myself in a situation where I would have to drill it (or rather ask my husband to drill it) to make it fit. Now, looking at the material page on Shapeways, I noted steel does have a margin of error. 3/8″ == 9.525 millimeters. 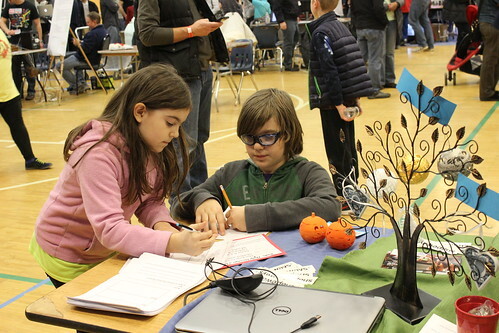 To calculate the margin of error, I multiplied that by 0.01 (1%) and added 0.1 to it (per their accuracy statement). Since there would be TWO walls (one of each side of the cylinder) that could affect my fit, I multiplied that by 2. I decided my hole would be 10.025. 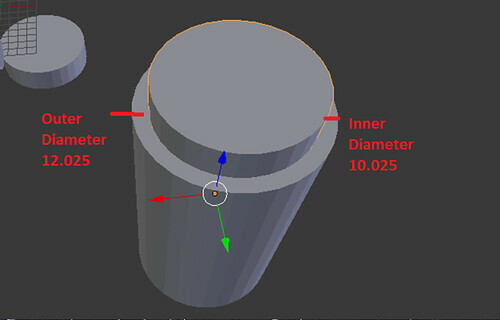 So my inner cylinder had a diameter of 10.025. I wanted my walls to be 1mm thick, so I made my Outer Cylinder 12.025 in diameter (remember there are two walls). Then using, you’ve guessed it, the Boolean Modifier, I subtracted the inner cylinder from the outer one. So get this—either I had beginner’s luck or my math was solid. My steel school bus arrived and the stud attachment was PERFECT. I had to tap it gently with a hammer to place it on the bottle stopper stud and there it has stayed nice and snug. 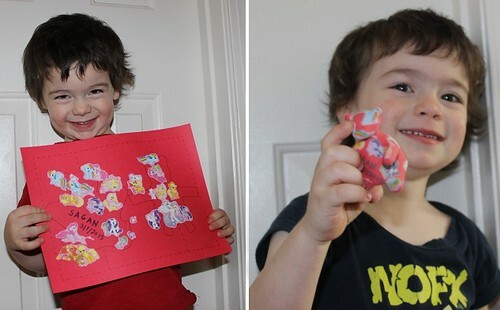 No adhesive necessary! Score! Note: If you are modeling for Niles Bottle Stopper #302 and you plan to print in the Strong and Flexible plastic, you may want to choose different diameters. I’ve found the plastic to fit looser and require glue. Before diving into the more expensive steel, I did print a version of the School Bus in cheap (and fast) White and Strong Plastic. It looked great (other than I shorted my Mom’s service years by 1), so I changed “23” to “24” and ordered a version in Gold Plated Steel. It arrived just in time for my Mom’s last day of school!!! A girlfriend of mine recently started selling Origami Owl. It’s a neat concept. You purchase a “Living Locket” which you can fill up with charms. Between exclusively pumping for 16 months for my first son and nursing my second son, breastfeeding has played a significant role in my life the last 2.5 years. It’s near and dear to my heart. Alas, Origami Owl did not have a breastfeeding-themed charm. A few months ago, I had run across Shapeways, a company that will 3D print your models for you, and I really wanted to try something out with them. This seemed like a first very easy project to learn Blender and 3D printing! I downloaded Blender for free from Blender.org. I watched a few tutorial videos to start to learn the software. The tutorial that applied most to what I wanted to do the most was “Modelling with Curves” by BlenderNerd. I did what the “Modelling with Curves” illustrated. I made a 2D image of what I wanted and then set that as the background to my grid. 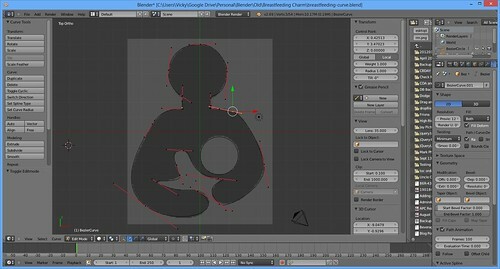 My 2D image was based off the Public Domain International Breastfeeding Symbol by Matt Daigle. I had to make some modifications to connect the Mom’s head to her body. Then I was able to use Bezier Curves to build my object. 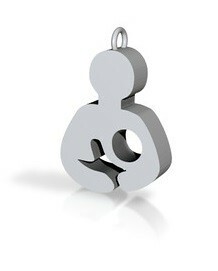 I extruded it to give it volume and voila– my breastfeeding charm! 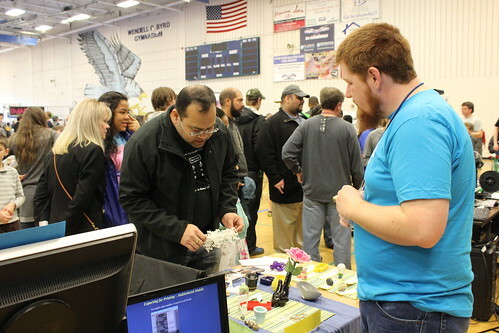 Now, I specifically wanted to learn Blender and 3D modeling. 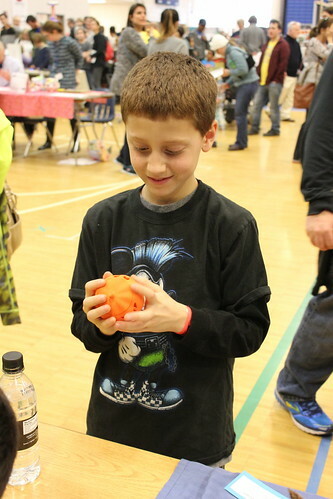 If you do not, Shapeways has a 2D to 3D Print Creator to make the model for you. I had the medium silver locket which is roughly the size of a nickel. I decided I wanted to keep my charm no larger than 17mm x 17mm. I was also going to aim to have it no more than 4mm deep. 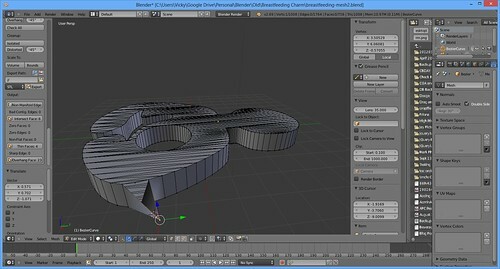 I decided to treat one Blender Unit as 1mm and I scaled my object appropriately. When I was satisfied with my curve, I converted it to a mesh. The command was Object->Convert To->Mesh From Curve/Meta/Surf/Text. 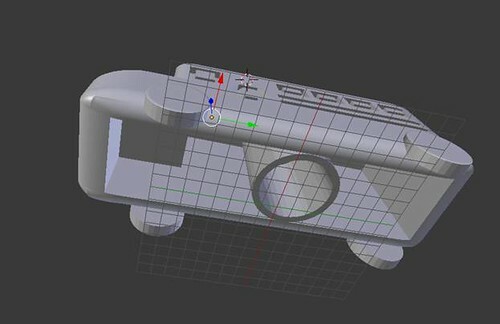 To help me achieve my end goal of 3D printing, I downloaded the 3D Printing Toolbox for Blender. This helped me out quite a bit by highlighting trouble spots in my model, specifically Non-Manifold Edges and where my walls were too thin. Almost immediately, I found out that tons of my edges were non-manifold. I didn’t know what the hell that was, but I knew it was bad. I did some Googling. Non-manifold meant it was an edge that did not connect to two faces. But… but…but… looking at my model, all those edges looked like they were connecting to two faces. Looks can be deceiving! It turns out, I had vertices over vertices. So those faces along the side of my curve, they weren’t connecting to my breastfeeding curve at all. 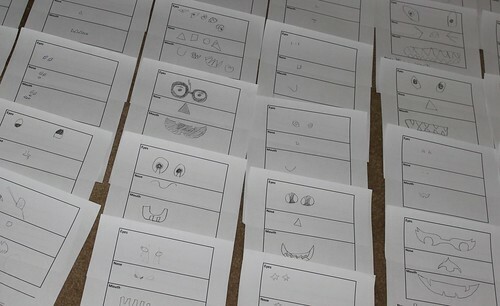 Oooh… My Faces Aren’t Actually Connected! No Wonder! What I did to fix it was just delete the duplicate vertices (which deleted my side faces) and then created new faces with the correct vertices that were hidden below my bad faces. A big hat tip to the “Fixing Non-Manifold Models” tutorial over at Shapeways. Specifically, the video under “Open objects: coincident edges” was an excellent illustration of what my models issue was. I also had an issue with thin walls. The Shapeways Material Comparison Sheet tells you the different specifications for each type of material. Sterling silver, for example, requires walls that are 0.6mm apart. The plastics, which I wanted to print my initial model on because it was cheap, required 0.7mm. The hole that made up the baby’s head…. well, it was too close to the wall that outlined the baby’s body. I did some rescaling of my object and moving of the baby’s head to fix the issue (which I got to learn the Border Select for). Once I had my Non-Manifold Edges and my Thin Faces eradicated, following the “Preparing Blender Files for 3D Printing” tutorial from Shapeways, I rotated my model 90 degrees along the X-axis and exported it to STL file. The 3D Printing Toolbox in Blender was warning me about “Overhanging Faces”, but that did not hinder my model from being accepted by Shapeways. Thanks to all the tutorials and research, my model file returned no errors on its initial upload. 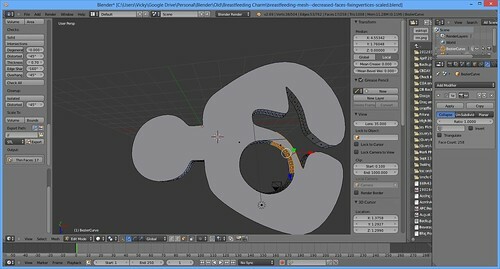 If I knew that, I may have named my model file something other than “breastfeeding-first-shapeways-submission”. 🙂 I was expecting multiple iterations and a lot of trial and error. I ordered a version in Hot Pink Strong & Flexible Plastic and a version in Alumide. 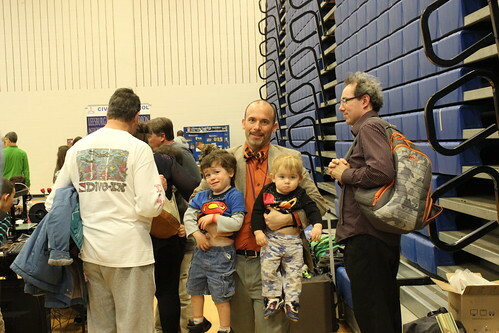 Because my models were so small, they were very economical – just a couple of dollars! I expected once I saw my prototypes I would order one in the more expensive silver, but I have found myself satisfied with the plastic versions. A few weeks later, I had my breastfeeding charms, which fit perfectly in my Origami Owl Living Locket! 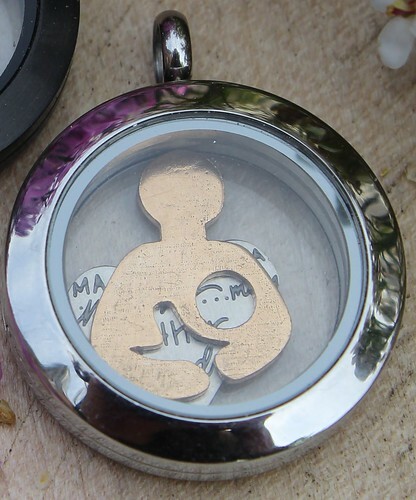 So now I have a breastfeeding charm in my Living Locket! 🙂 My camera had a horrible mishap this winter, so behold my charm via my cellphone camera. It currently hangs out in my Living Locket with birthstones for my two sons. 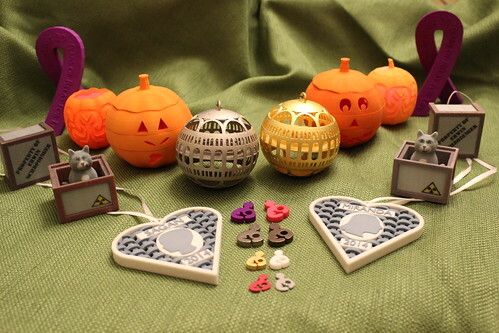 If you happen to want the Living Locket version, you can order one for yourself at Shapeways. I have a prototype of a pendant version on order that I should see in a few weeks. If all looks good, I’ll make that one available as well. Also feel free to download the model for your own projects! Go Public Domain!